The last step in finishing was to add pockets. I played around with different sizes and debated two versus four. A great way to visualize size and placement is to cut pockets from shop towels (they are heavier than paper towels) and play around until you get the right look. I had four larger buttons and decided to add them at the center front. They are sewn at the right front edge and don’t actually fasten. 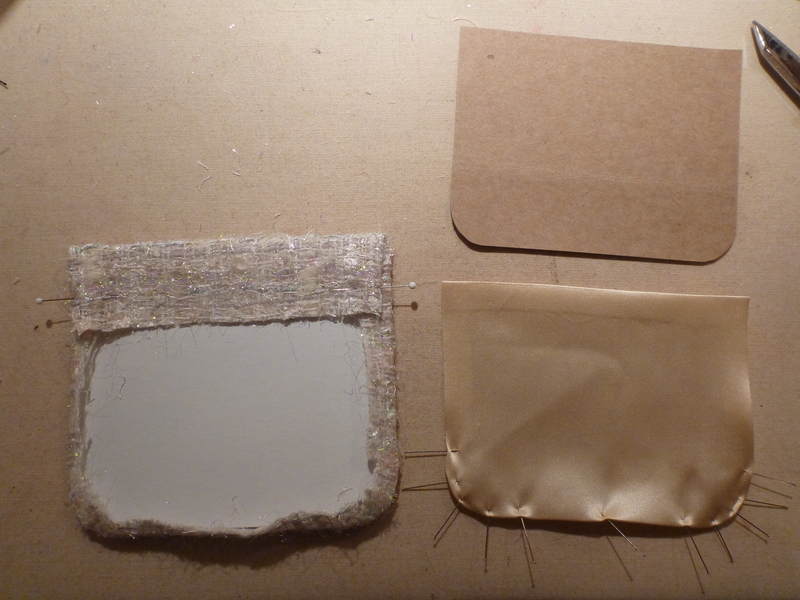 I find it easiest to get pockets exactly the same size and shape by pressing the pocket around a cardboard template. 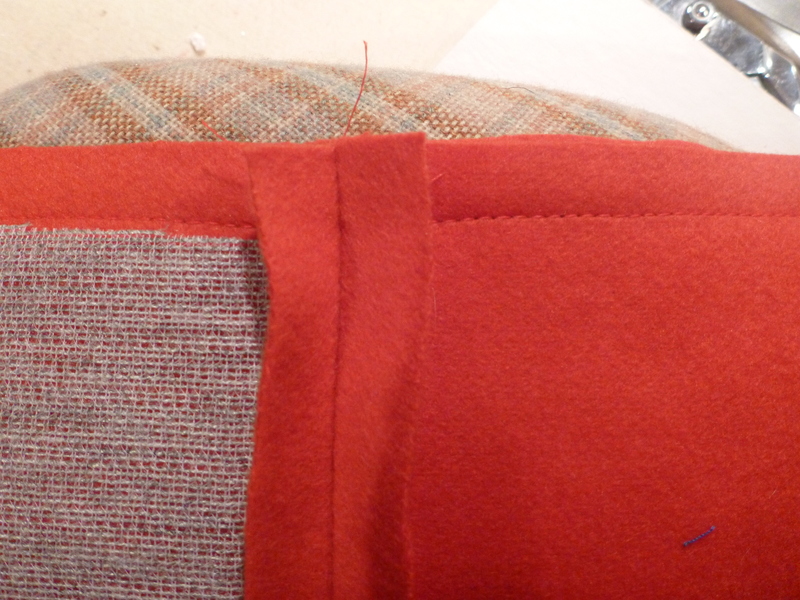 I interfaced the pocket with bias cut interfacing which is cut just a tad smaller than the finished pocket. The bias gives the pocket a softer shape. I cut a slightly smaller template for the lining. Slip stitch the lining to the pocket, attach trim and slip stitch to the jacket. Don’t catch the lining when doing this. I had a chance to get a closeup look at some geniune Chanel jackets at an upscale resale shop on Madison Ave. and noted some distinctive details. Trims are applied after construction and are made to be removed if necessary for cleaning. More about my findings in the next post. I was sidetracked by an request from my daughter-in-law. She was invited to join the hunt staff of our local equestrian team. Hunt staff wear red jackets and bespoke versions are a small fortune. 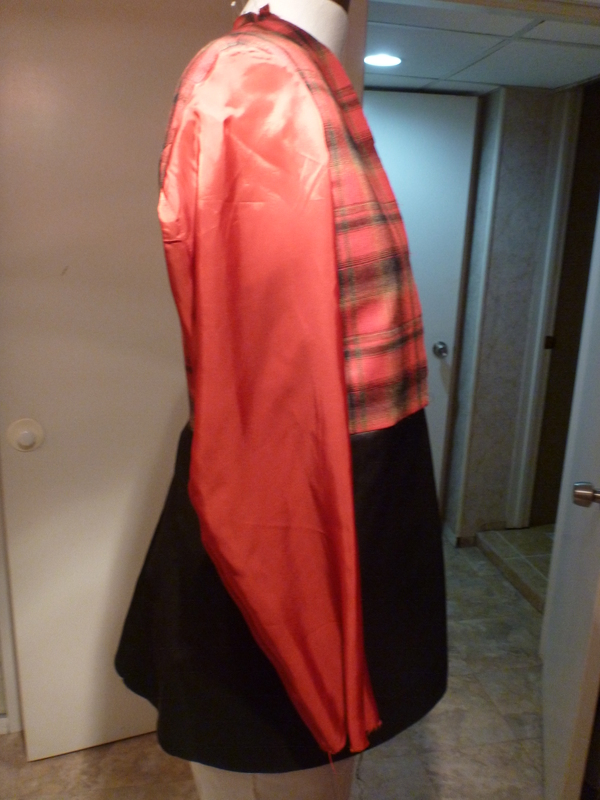 Since I had made her wedding gown, she figured a jacket would be an easy task. Just make a tailored jacket from a commercial pattern, right? Wrong. 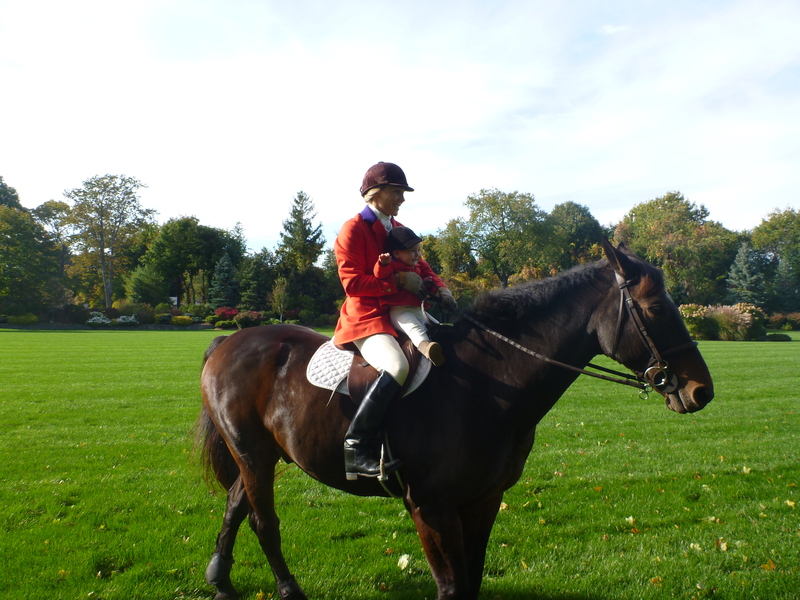 Riding clothing is another animal. We combined my research and her knowledge and came up with a punch list of what this garment needed. Mood Fabrics had a beautiful heavy wool/cashmere/nylon fabric. They also had abrasion resistant lining and wool flannel for the upper jacket lining. I drafted a fitting muslin from cotton canvas which mimicked the weight and drape of the wool better than lightweight muslin. Note the exaggerated curve of the sleeve. The roomy armhole. I would never have guessed this much ease would be required. The jacket fabric was thick and required loads of steam and heavy use of a tailors clapper to get things flattened into shape. 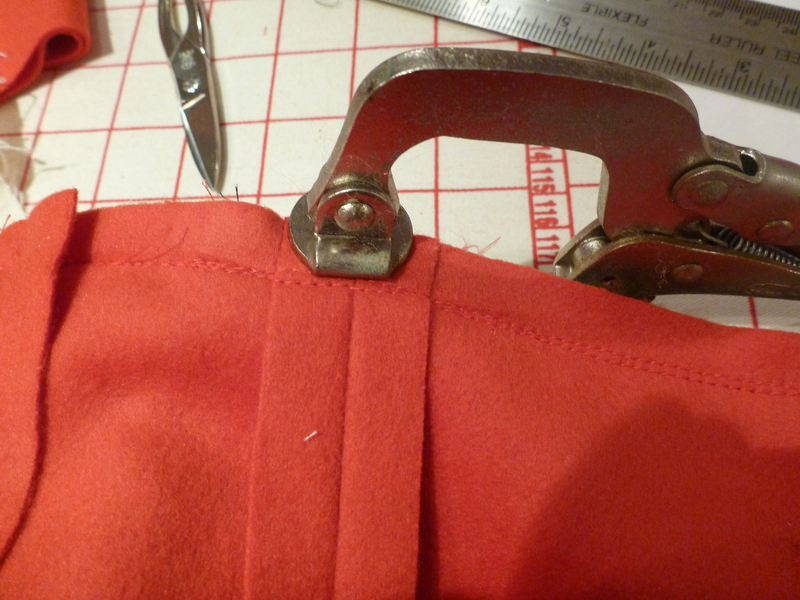 I found it helpful to flatten the inside of especially bulky seams with a clamp from the hardware store. Get loads of steam into the fabric, clamp it down hard, and leave until it’s cold. 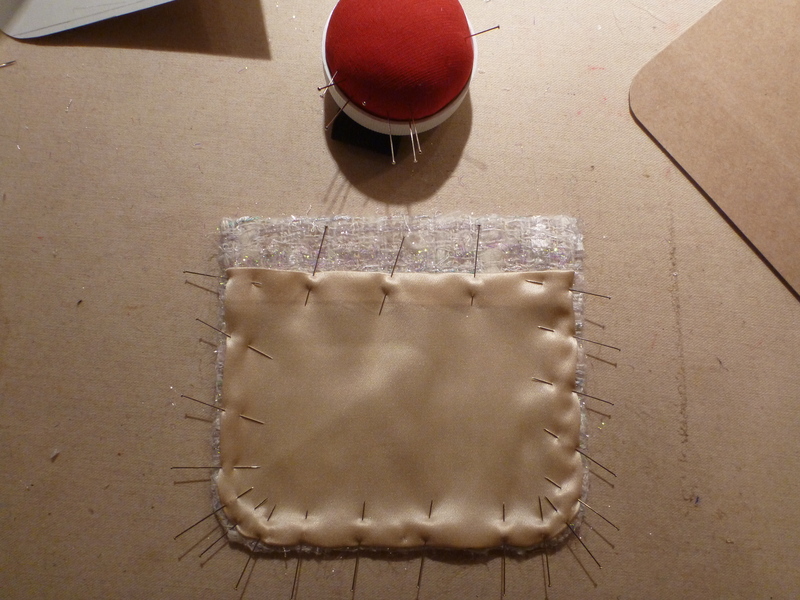 Also, don’t sew across the layers of intersecting seams. You can get a much flatter press by folding the seam allowances to one side and end the stitching at the seamline. Fold the seam allowances the other direction and begin stitching at the seamline. The seam allowances will remain free and press much flatter. Inside the jacket showing the various linings used. 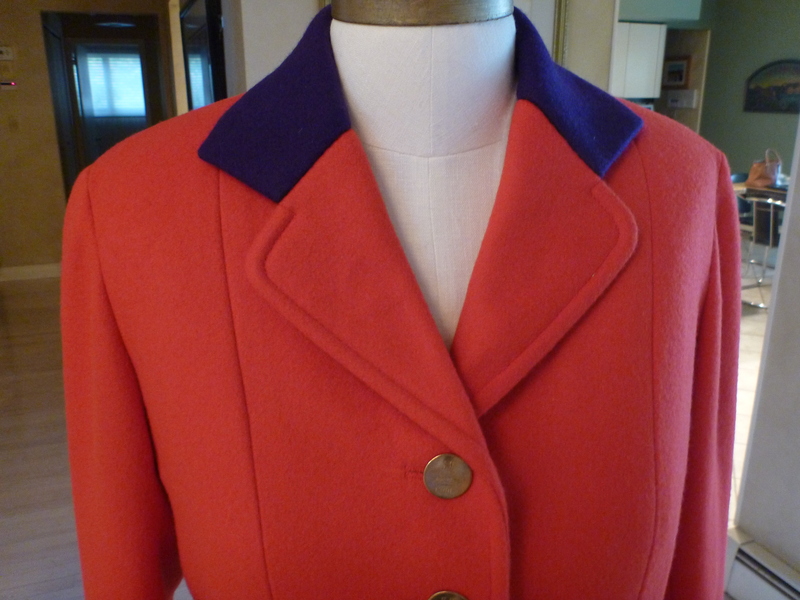 The color of the upper collar is unique to the particular hunt club; her’s is purple. The fabrics were so heavy and it was applied with traditional tailoring techniques. I couldn’t resist using the leftover fabric for a matching jacket for the one year old. Fittings were a bit of a challenge on a squirmy baby but we got it done! Mommy and daughter out for a ride. What incredible jackets, Mary! Your Chanel is exquisite and I look forward to reading more about your Chanel discoveries. No doubt your daughter in law is sure wearing the best looking jacket of the hunt staff and your grandson’s jacket is over the top! Oh wow Mary , they both look wonderful . How did you attach the purple collar ? The undercollar is pad stitched to felt which gives you non-ravelling edges. 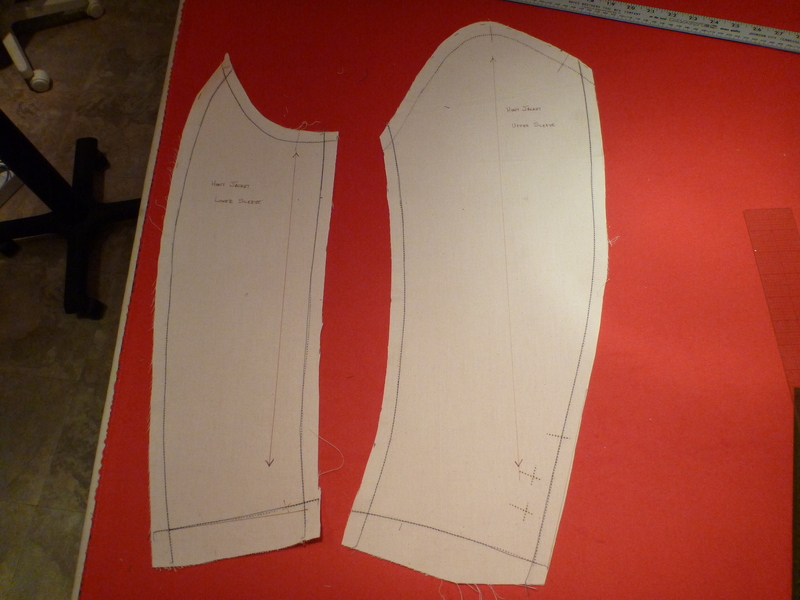 I cut the upper collar with generous seam allowances. 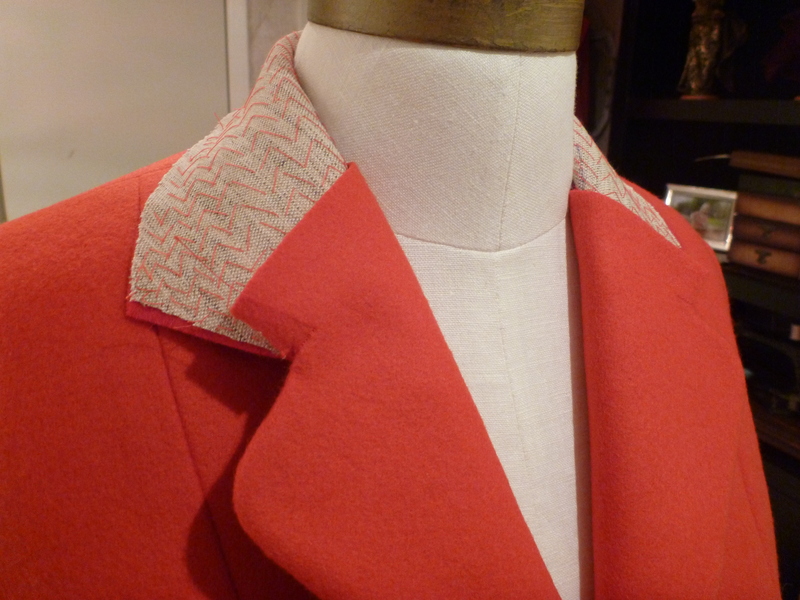 Pin the collars together at the roll line and shape the upper collar over the under collar. Fold the seam allowances at the gorge line under and slip stitch. 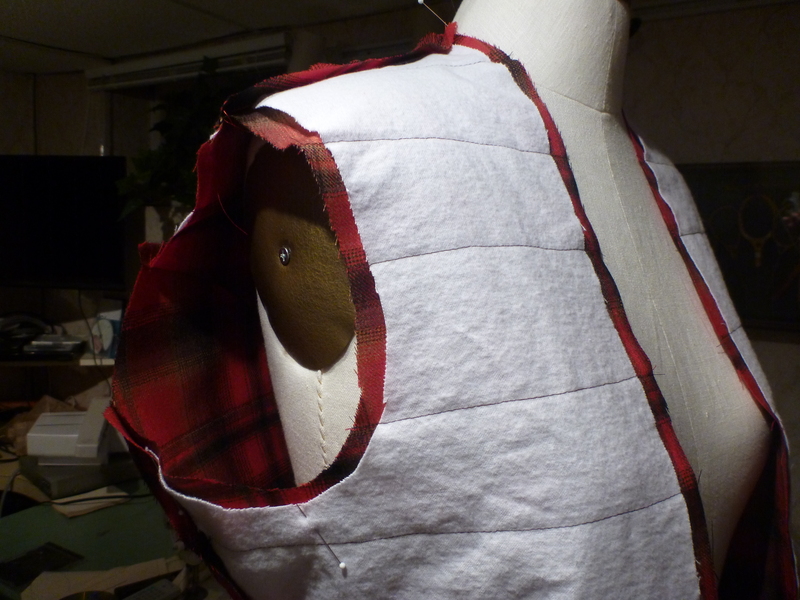 Fold under the remaining upper collar seam allowances and fell stitch the under collar in place. This is a very brief description and I would be happy to send you an email with photos and additional instructions if needed. Thanks for the compliment. Exactly the way we learned in apparel design school, tailoring class. But how many of us continue to use the “old school” tailoring methods? Very few, because we don’t have the talent, patience, and craftsmanship that Mary has, and her beautiful riding jacket fully demonstrates those traits. Wow, what a great example of traditional tailoring. This was a perfect example of why the “old school” techniques are often the best. They work! No shortcuts but the results are worth it. What a lovely post. The Chanel looks fabulous with the pockets and buttons. The cardboard template is a great tip and one I will definitely be using and the pink jackets are amazing. My father used to hunt and had his jacket tailor made. Will have to send you a photograph next time I am up at my Mum’s. I would love to see a photo. Interesting that they are red but known as pink jackets. Wow, fantastic job on all of those difficult projects! Your jacket looks great and the mother/daughter jackets should win a prize. The clamp from the hardware store is a great idea, but be sure to hide it. I know the men in my life are constantly trying to raid my sewing “toolbox”! Thanks. Sarah and Sage love their outfits. I keep my tools in a secret drawer so no one can find them! All the men in my house know it’s death to whoever messes with my stuff. 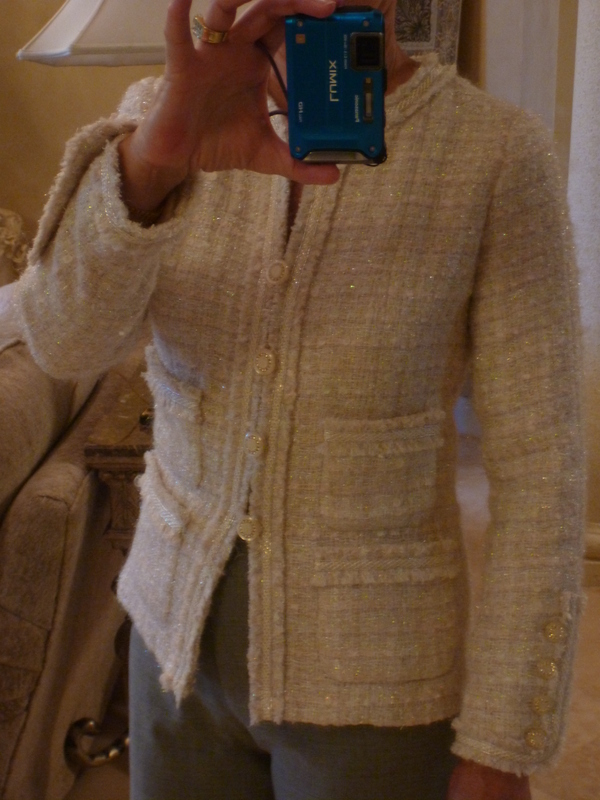 Have been avidly following the Chanel jacket as mine is in the offing. The hunt jacket is truly a work of art. Looking forward to more. Glad you liked it and I hope found some helpful tips. Thanks. Fabulous workmanship on the jacket! Mom and daughter look great. I love reading a post like this which gives some great construction tips (clamps, intersecting seams, buttons right on the front edge of your Chanel-type jacket, etc.) and which also features three (!!) gorgeous jackets. All three are so beautiful. Your granddaughter’s jacket is the cutest little jacket I have ever seen. Thanks. 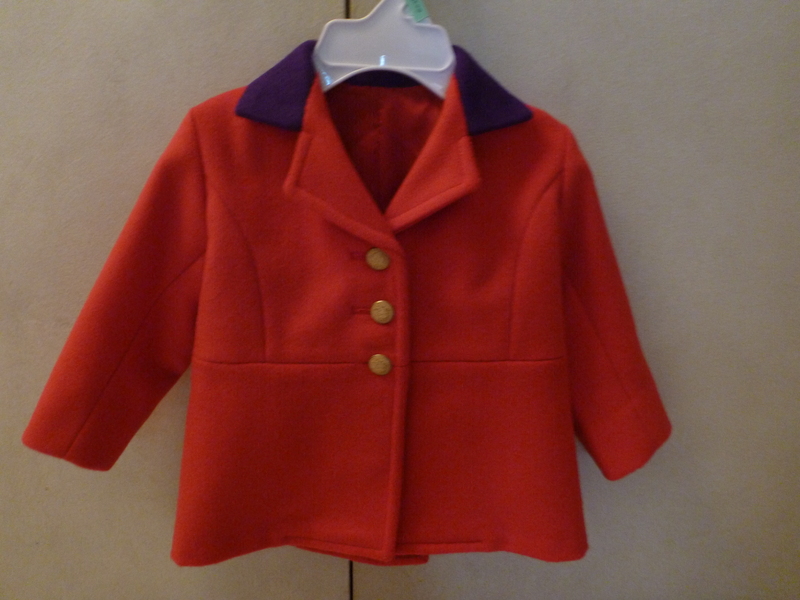 It was a rewarding project and the baby’s jacket was such fun. Thank you. I hope you try making your own. Thanks. I just saw the photos on your website. Beautiful work. I don’t read Swedish but will follow your work. The photos show enough. Thanks. They were a big hit at opening day of the hunt season. Holy cow. I am seriously impressed. What a lot of skill you have! I wouldn’t be surprised if the rest of the hunt club would like you as a tailor as well. I liked your description of the hand attachment of the purple collar. As I took it from what you said, you did not press under the purple seam allowances but just folded them and pressed afterwards? How did you avoid a bulky look there and pressing “shine”? I always get tripped up by details like that. Also, I would not have thought of pinning on the roll line although it’s obvious when you think of it. Thanks for that! To avoid shine I use a homemade press cloth which is a layer of wool and layer of heavy cotton drill. I also concentrate the steam by applying water with a paint brush to just the area I’m working on. Steam heavily, place a tailors clapper over the section, weights on top of the clapper and leave until cold. You can get crisp beautifully pressed seams and edges on the heaviest wool. A pro photographer took photos of the event and one of Sarah and Sage is on the cover of a magazine. Your jackets are really well made and look beautiful! Great job!!!! And besides it all, I’ve learned some tricks with your shoulder pad tutorial.